Normal airway is one of the important factors for the normal growth of the craniofacial structures. The close relationship between the pharynx dentofacial and craniofacial structures determines their mutual interaction. Clinical detection of structural narrowing of the upper airway may facilitate early recognition of obstructive sleep apnea. Over the years, various techniques like cephalograms, cine-computed tomography, fluoroscopy, acoustic reflection, fibreoptic pharyngoscopy, magnetic resonance imaging have been employed for the assessment of upper airway. The advanced techniques for assessment are more expensive and may not be available at dispense in all places. Cephalometry enables analysis of dental and skeletal anomalies as well as soft tissue structures and form. 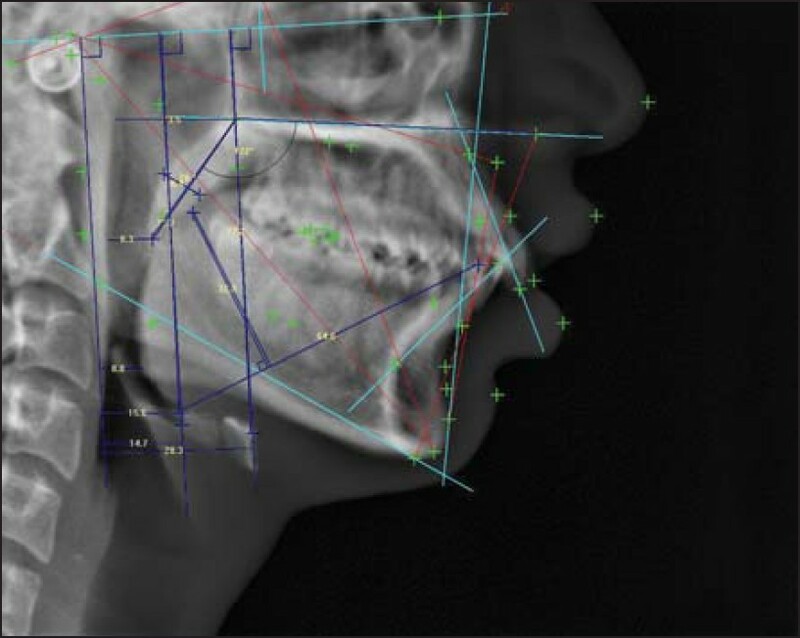 The present study aims to obtain measurements of the upper airway space through lateral cephalometric analysis in young Indian subjects without any facial deformity or obvious sleep apnea. It represents preliminary data to establish normal values and range in both sexes for upper airway - by means of size of tongue, soft palate, nasopharynx, oropharynx, hypopharynx, and relative position of hyoid bone and vallecula. 60 Lateral cephalograms (30 males and 30 females) were selected from the database of oral radiology department. Lateral cephalometric radiographs were taken using a standardized technique, with the jaw in centric relation and the teeth in occlusion, the lips relaxed, and the head in the natural head position. X-ray machine used was Kodak 9000 C. Cephalograms with class I occlusion were selected for the study. The patient records were consulted to rule out presence of history of sleep-related disorders and history of obesity. Radiographs of patients with obvious skeletal abnormalities, history of sleep-related disorders, and history of obesity were excluded from the study. Digital images were assessed for linear angular measurements using in built software with in the machine. Inbuilt McNamara analysis was used for ease of identification of landmarks and additional landmarks were marked as necessary. The summary of landmarks used for the assessment has been described in [Table 1] and [Table 2]. 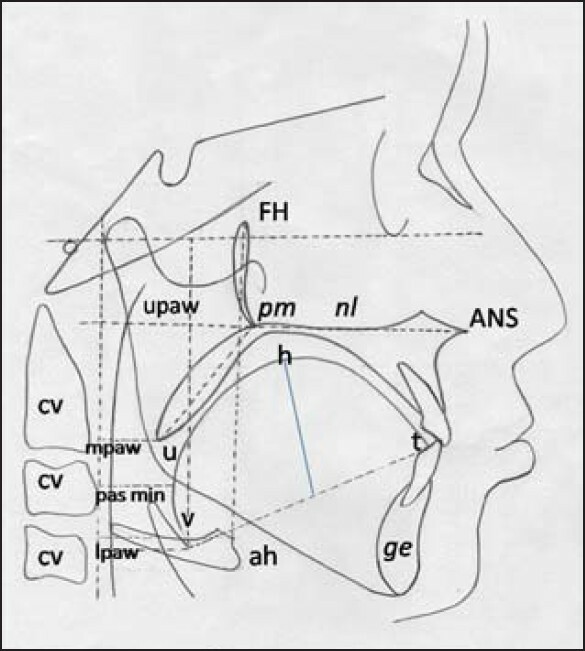 The position of the soft palate was determined by an angle (nl/pm-u) - the angle between its nasal line (nl) and long axis of soft palate (pm-u) [Figure 1] and [Figure 2]. Image pixel area-image pixel height x image pixel width. e.g. - soft palate area (mm 2 ) = Image area (mm 2 )/ Image area pixels x Soft palate area (mm 2 ). The data was statistically analyzed by Student's unpaired t-test. T-value <0.05 was considered to be significant. All parameters were assessed by a single observer and the observations were repeated at an interval of one month. Student's paired t-test was used to assess intra-observer variation and there were no significant differences in the values of the observed parameters. A total of 30 males and females in the age range of 18-40 years were included in the study. 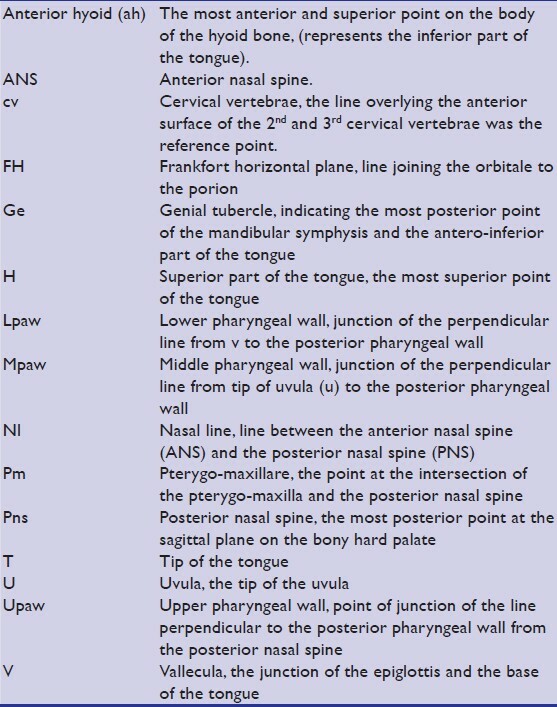 Among all the linear variables assessed the following measurements, length of tongue, tongue height, soft palate thickness, depth of hypopharyngeal space, pas-min, position of vallecula in vertical plane, distance of vallecula to cervical vertebra in horizontal plane, position of hyoid in vertical plane, position of hyoid in horizontal plane, were significantly higher in males as compared to females. 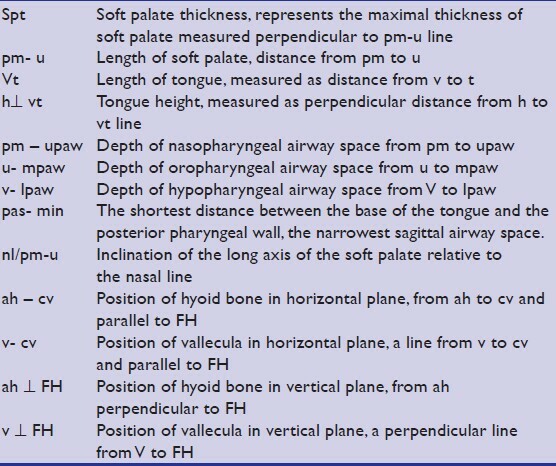 Also, the angle of inclination of soft palate was higher in males than in females [Table 3]. 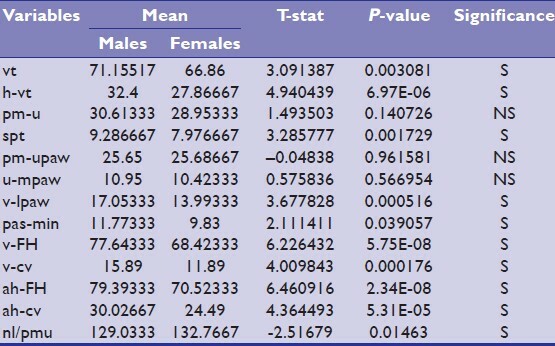 Among the areas assessed tongue area, oral area, nopa areas were significantly higher in males [Table 4]. The results indicate that vertical and horizontal distances of vallecula and of hyoid bone were bigger in males than in females implying more inferiorly and anteriorly positioned vallecula and hyoid bone in men. Hypopharyngeal and oropharyngeal spaces were larger in males due to abrupt angle between hard and soft palate which increases distance between uvula and posterior pharyngeal wall and more anterior and inferior position of vallecula which in turn increases the distance between vallecula and posterior pharyngeal wall. The lateral cephalogram is routinely used radiograph for orthodontic treatment purposes. It is a two-dimensional representation of sagittal aspect of head and neck region. Maltais et al. have opined that the use of cephalometric radiographs to assess the upper airway anatomy is helpful because it is simpler than other methods for measuring airway patency. Parkkinen et al. further confirm in their study that the lateral cephalogram is a valid method for measuring dimensions of the nasopharyngeal and retropalatal region. In view of ease of availability of previous radiographic data and patient records the present study utilized the available radiographic records and a retrospective analysis was done to establish normal values of airway in subjects. The region of minimal airway space (pas min). The position of the soft palate was determined by an angle - the angle (nl/pm-u) between its long axis (pm-u) and the nasal line (nl). (ta+spa)/nopa-Relationship between combined tongue and soft palate areas and naso-oropharyngeal area. The length of the tongue in sagittal dimension length, height of the tongue, thickness of soft palate, linear dimension of hypopharynx, region of minimal airway space, inclination of soft palate, vertical and horizontal distances of vallecula and of hyoid bone were larger in males compared to females. Bacon et al. have found in their study on patients with obstructive sleep apnea that patients had decreased sagittal dimension of cranial base, retruded chin, and hence retruded tongue position. The mean length of soft palate in normal subjects in their study was 38.7 mm whereas in the present study it was 33.7 mm. Battagel et al. in their study have compared the cephalometric morphology of patients with obstructive sleep apnea and in normal subjects among Caucasian males. The mean angle of soft palate inclination in normal subjects in their study was 126.9° where as in the present study the mean inclination of soft palate was 129°. Furthermore, the length of soft palate, soft palate area, and tongue area in normal subjects in their study was 24.4 mm, 410 mm 2 , 4120 mm 2 , respectively. However, in the present study length of soft palate, soft palate area, tongue area were 30.6 mm, 235.7465 mm 2 , 2479.432 mm 2 , respectively implying the tongue area and soft palate area in normal males in the present study were comparatively of smaller dimension with respect to normal Caucasian males. Zhong et al. in their study have compared the upper airway dimensions among Chinese non-snoring children of different sagittal and vertical skeletal facial morphologies (class I, II, III). The upper airway dimension (u-mpw) among class I subjects in their study was 11.2 mm, and 10.68 mm in the present study, whereas lower pharyngeal airway (vlpaw) was 17.3 mm in their study and 15.45 mm in the present study. Tsai et al. have investigated the pharyngeal airway structural changes seen during development from the early mixed dentition into adulthood in untreated normal Taiwanese persons and also to compare the same among males and females. Few parameters like upper pharyngeal depth, length of soft palate, position of hyoid bone in horizontal plane did correlate with results of the present study. The present study is one of its kinds for having compared airway dimensions among normal south Indian male and female subjects. 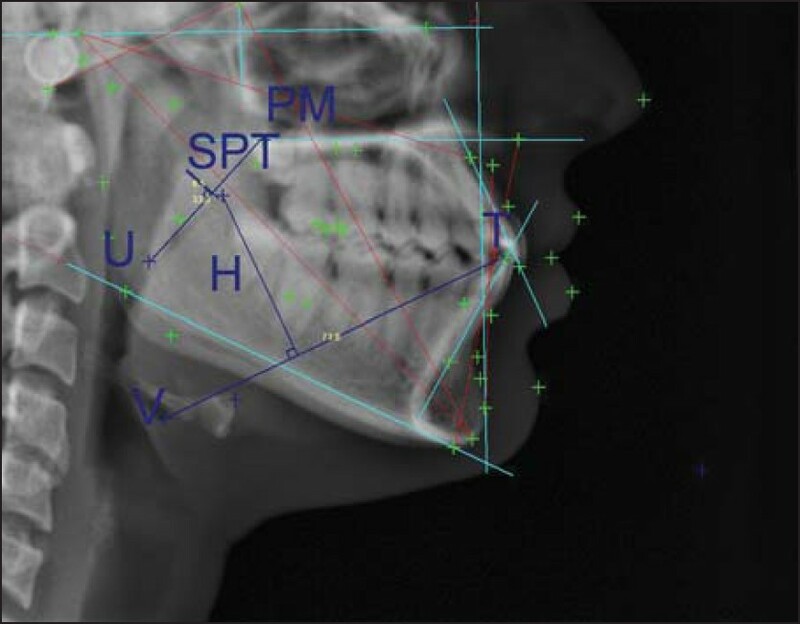 Cephalometry has proved to be a useful adjunct not only for orthodontic treatment planning but also for assessment of upper airway related structures. Julià-Serdà et al. in their study have implied that cephalometry combined with clinical variables, physical examination, and nocturnal oximetry is useful in the diagnosis of OSA and enables the sparing of a considerable number of polysomnographies. The present study also signifies the importance of use of cephalometry for the assessment of upper airway. With an added advantage of ease of availability and reduced radiation exposure as compared to advanced imaging techniques, cephalometry proves to be an important and useful adjunct for airway analysis. The only disadvantage being transverse dimensions cannot be assessed. The implications of the present study include vertical and horizontal distances of vallecula and of hyoid bone were bigger in males than in females implying more inferiorly and anteriorly positioned vallecula and hyoid bone in men. Also, hypopharyngeal and oropharyngeal spaces were larger in males due to abrupt angle between hard and soft palate which increases the distance between uvula and posterior pharyngeal wall and more anterior and inferior position of vallecula which increases the distance between vallecula and posterior pharyngeal wall. The present study may add or adjunct in investigating upper airway abnormalities and the sample radiographs presently included only random selection of radiographs and future studies can assess the airway dimensions in different skeletal malocclusions and also pre and post treatment situations. The cephalometric measurements of the upper airway in this study group can be used as normative data for future studies. The authors are thankful to Dr. Srinath L Thakur Principal SDM Dental College for permitting to conduct the study, Dr. Ashith B Acharya for his valuable guidance. 1. Batool I, Shaheed M, Rizvi SA, Abbas A. Comparison of upper and lower pharyngeal airway space in Class ii high and low angle cases. Pak Oral Dent J 2010;30:81-4. 2. Samman N, Mohammadi H, Xia J. Cephalometric norms for the upper airway in a healthy Hong Kong Chinese population. Hong Kong Med J 2003;9:25-30. 3. Aloufi F, Preston CB, Zawawi KH. Changes in the upper and lower pharyngeal airway spaces associated with rapid maxillary expansion. ISRN Dent 2012;2012:290964. 4. Cakarne D, Urtane I, Skagers A. Pharyngeal airway sagittal dimension in patients with class 3 skeletal dentofacial deformity before and after bimaxillary surgery. Stomatologjia 2003;5:13-16. 5. Togeiro SM, Chaves CM Jr, Palombini L, Tufik S, Hora F, Nery LE. Evaluation of the upper airway in obstructive sleep apnoea. Indian J Med Res 2010;131:230-5. 6. Arya D, Tripathi A, Singh SV, Tripathi S, Nagar A, Mishra A. A pilot study to evaluate post- treatment cephalometric changes in subjects with OSA. J Prosthet Dent 2010;103:170-7. 7. Maltais F, Carrier G, Cormier Y, Sériès F. Cephalometric measurements in snorers, non-snorers, and patients with sleep apnoea. Thorax 1991;46:419-23. 8. Pirilä-Parkkinen K, Löppönen H, Nieminen P, Tolonen U, Pääkkö E, Pirttiniemi P. Validity of upper airway assessment in children: A clinical, cephalometric, and MRI study. Angle Orthod 2011;81:433-9. 9. Shen GF, Samman N, Qiu WL, Tang YS, Xia J, Huang YL. 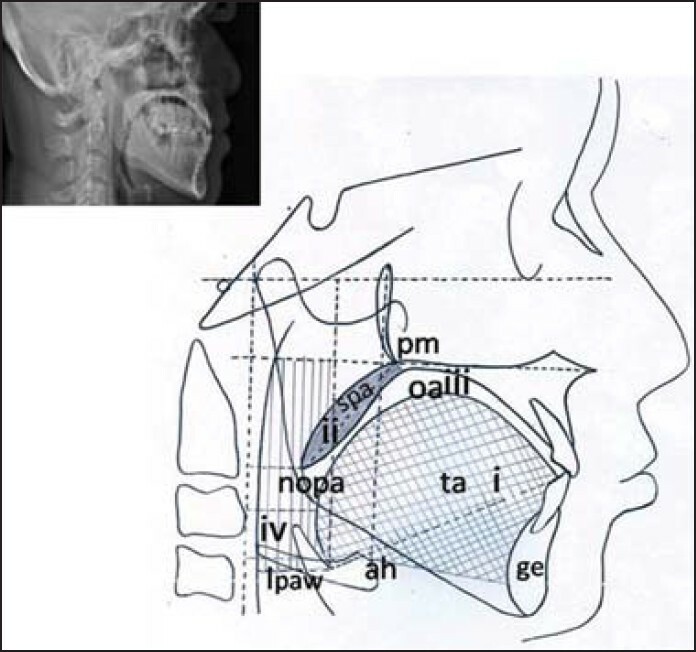 Cephalometric studies on the upper airway space in normal Chinese. Int J Oral Maxillofac Surg 1994;23:243-7. 10. Bacon WH, Turlot JC, Krieger J, Stierle JL. Cephalometric evaluation of pharyngeal obstructive factors in patients with sleep apneas syndrome. Angle Orthod 1990;60:115-22. 11. Battagel JM, L'Estrange PR. The cephalometric morphology of patients with obstructive sleep apnoea (OSA). Eur J Orthod 1996;18:557-69. 12. Zhong Z, Tang Z, Gao X, Zeng XL. A comparison study of upper airway among different skeletal craniofacial patterns in nonsnoring Chinese children. Angle Orthod 2010;80:267-74. 13. Tsai HH. Developmental changes of pharyngeal airway structures from young to adult persons. J Clin Pediatr Dent 2007;31:219-21. 14. Susarla SM, Abramson ZR, Dodson TB, Kaban LB. Cephalometric measurement of upper airway length correlates with the presence and severity of obstructive sleep apnea. J Oral Maxillofac Surg 2010;68:2846-55. 15. Reddy JT, Korath VA, Adamala NR, Adusumilli G, Pichai S, Varma KV. Cephalometric evaluation of oropharyngeal airway dimension changes in pre- and postadenoidectomy cases. J Contemp Dent Pract 2012;13:764-8. 16. Grewal N, Godhane AV. Lateral cephalometry: A simple and economical clinical guide for assessment of nasopharyngeal free airway space in mouth breathers. Contemp Clin Dent 2010;1:66-9. 17. Julià-Serdà G, Pérez-Peñate G, Saavedra-Santana P, Ponce-González M, Valencia-Gallardo JM, Rodríguez-Delgado R, et al. Usefulness of cephalometry in sparing polysomnography of patients with suspected obstructive sleep apnea. Sleep Breath 2006;10:181-7.